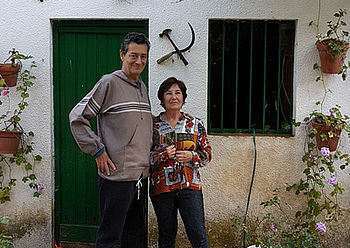 “Comunista y enamorao de la vida, o al revés” / “Communist and in love with life, or the other way around” (the way he presented himself in his facebook page). The network of transform! europe deeply deplores the death Javier Navascues, co-founder of our network and for many years a member of its board representing FIM, the political foundation of the Communist Party of Spain (PCE). With his intelligence, knowledge and fighting but cooperative spirit, Javier played a decisive role in the development of the ideological and political profile of our network. He was present with exciting contributions in all our activities in Europe and throughout the world: in the World Social Forum, the European Social Forum, the Summer Universities of the Party of the European Left, in conferences, seminars and workshops of transform! and its member organizations, in our newsletters, periodicals and Yearbooks. Javier was a Marxist with a deep knowledge of political economy, a non-dogmatic Andalusian, Spanish and Southern European communist of broad horizons, a brave activist of social movements, an honest citizen, a tender companion of Paula and a caring father, a man with whom one could talk for hours, drinking and smoking, a dear friend, a precious comrade. We will remember him with love and gratitude. From the Marxist Research Foundation (FIM), we regret to report the death of Javier Navascués, Professor at the University of Seville, current Head of the Policy Section and member of our foundation. Navascués was Director of the FIM from 2000 to 2008, one of the most fertile times of the foundation, years in which the History Congresses and the Development Economics Congresses of the PCE took place, and he also organized the tributes to Manuel Sacristán and Simón Sánchez Montero. During his tenure, sections such as aesthetics and literature were created, magazines such as the Journal of Marxist Literary Criticism were published, and relations with public universities and the expansion of FIM activities throughout the country were consolidated. Navascués stood out for his dedication to the impulse of the left in Europe, being one of the founders of the transform! network, one of the most important networks of the European foundations. Under the direction of Javier Navascués, the FIM experienced an important growth among a new generation of young students, who are currently developing a significant task of spreading Marxism from the Spanish and European universities. Finally, Javier Navascués was also a prominent leader of the PCE, of which he was secretary of training and debate, as well as a leader of Izquierda Unida de Andalucía and author of many of the most important initiatives and programmatic alternatives of that organization. Navascués was the author of an important intellectual work and he wrote numerous theoretical articles in the magazine Nuestra Bandera (Our Flag), and he worked also for the dissemination of Marxism through his column in Mundo Obrero. Work that has been compiled in the book “Navegando en aguas peligrosas. Una actitud ante las crisis” (Navigating through dangerous waters: an attitude towards to crises), published by Atrapasueños in 2017. From the FIM we want to convey our condolences to his partner and daughter, his family and friends. Hasta siempre Javier. We will follow your example. The newsletter informs about activities of our network, European and worldwide political developments and initiatives of social movements.